Schwab is a one-stop shop for nearly everything investing-related. Two trading platforms, extensive research, low commissions rates, and even automated investment management make it one of the premier full-service discount brokers. But TD Ameritrade is no David to Schwab’s goliath. After snapping up thinkorswim some years ago, TD Ameritrade was able to boast the best options trading platform around. So how do these top online brokers fare today? 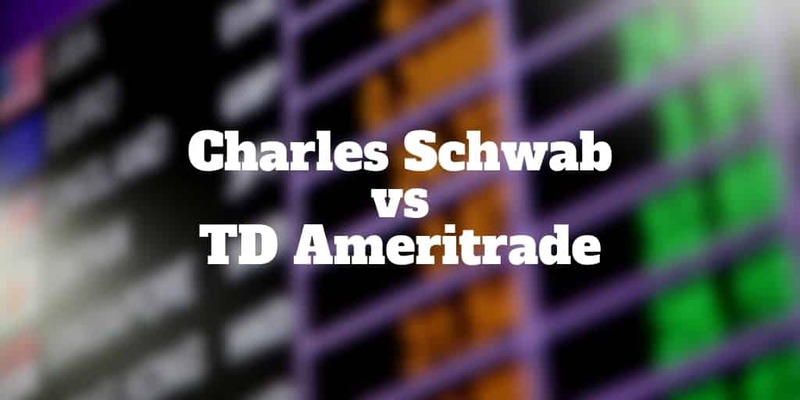 We compare Schwab vs TD Ameritrade to see who comes out on top across key factors like pricing, investment minimums, account selection, and trading platforms. Schwab charges a $4.95 commission for each stock trade and requires a minimum account balance of $1,000. An option trade costs an additional $0.65 per contract. For margin accounts, a $2,000 minimum balance is required. Schwab uses a sliding scale to assess margin trading fees; the scale starts at 9.075% on borrowed funds under $25,000. The cheapest rate, which applies to amounts between $250,000 and $999,999, is 8%. TD Ameritrade charges $6.95 per trade but has no basic account minimum. It tacks on an additional $0.75 fee per options contract. For margin privileges, you also need to meet a minimum $2,000 account balance. The brokerage charges 10% interest on what you borrow up to $10,000 and 8% for loan amounts between $250,000 and $999,999. Schwab provides clients with two trading platforms: StreetSmart and Trade Source. TD Ameritrade offers three trading platforms: thinkorswim, Trade Architect, and Web Platform. TD Ameritrade’s thinkorswim platform is your portal to market research, real-time data, technical studies, instructional videos, trading demos, and virtual accounts. Schwab’s corresponding platform is called StreetSmart Edge, which can be downloaded from the Schwab website. thinkorswim: Active traders with experience will fare best at thinkorswim, which was originally built with options traders in mind. The emphasis on stock and options trading is clear. Just about any options strategy you may wish to place can be supported. thinkorswim also caters to futures and forex traders. Where thinkorswim shines brightest is its vast tool suite of screeners, virtual trading platform, backtesting capabilities, and even an embedded programming language. Web Architect: If you are a beginner stock market investor, Web Architect is the best place to begin at TD Ameritrade. You can create asset allocation strategies using the Portfolio Planner tool using exchange-traded funds, stocks, bonds, and mutual funds. The tool can also keep your portfolio balanced over time so no single holding becomes too risky. If you get stuck at any time, Ted the chatbot is available to help you get back on track! Trade Architect: If Web Architect is for beginners and thinkorswim is arguably professional-grade, Trade Architect is the perfect in-between trading software platform. Unlike thinkorswim, which is downloadable to desktop, Trade Architect is available as a web-based interface. Like thinkorswim, options traders can find risk graphs, screeners and heat maps. But the navigation tends to be a little more intuitive than it is at thinkorswim. Schwab was founded with a mission to make investing accessible to almost anyone and its trading software platforms reflect that mission. StreetSmart and Trade Source are its two trading platforms. StreetSmart: Whether you prefer to trade via web-based interface or downloadable desktop, Schwab caters to both. A mobile version of Street Smart is also available. StreetSmart Edge is Schwab’s rival to thinkorswim, and while it’s got a lot to love for stock and options traders it’s not quite in the same league. Trade Source: This is an online platform only that features real-time pricing, technical charts and studies, as well as research. Overall: Comparing the best platform each broker has to offer, TD Ameritrade wins with its thinkorswim platform that has all the bells and whistles any trader could wish for and pips StreetSmart Edge before the post! From stocks to bonds to mutual funds, almost everything is tradeable at both brokers but only TD Ameritrade offers forex trading. Schwab’s trading fee is $4.95 while TD Ameritrade’s is $6.95. In addition to traditional online stock trades, Schwab offers a selection of pink sheet securities as well as over-the-counter bulletin board trading which are best known for their wide selection of penny stocks. Tools like Equity Ratings, Schwab Stock Lists, and detailed stock comparison charts are also at your disposal. TD Ameritrade enables stock trading on both its standard web platform and its thinkorswim app. Immersive online tutorials get you up to speed on stock basics and portfolio management. Morningstar, CFRA, and MarketEdge help you decide where you want to invest. TD Ameritrade can handle both simple stock options and multi-leg options. The fee to trade options is a $6.95 transaction fee plus $0.75 per trade. Schwab also offers multi-leg options for $4.95 plus $0.65 per transaction fee. The former OptionsXpress platform (now integrated to Schwab) provides advanced features for more experienced traders, including virtual trading, streamlined order entry, and risk analysis. Schwab offers thousands of One Source funds with no loads or transaction fees. TD Ameritrade offers more than twice as many mutual funds, both no-load and load funds, when compared to Schwab. Schwab features over 240 commission-free One Source ETFs. TD Ameritrade lists around 300 no-commission ETFs independently chosen by Morningstar. You will pay your platform’s per-trade fee when purchasing ETFs that are not on the commission-free list. TD Ameritrade enables ETF trading on its web, thinkorswim, and mobile platforms. Schwab also offers across-the-board ETF investing. The brokerage has recently rolled out its online 1000 Index ETF, based on its longstanding Schwab 1000 Index, to help you narrow down your options. TD Ameritrade connects customers to a robust bond market, including individual bond trading, bond mutual funds, and bond-based ETFs. Some of them are commission-free, but the majority come with a $1 per transaction fee on secondary trades. The trading platform includes such tools as Bond Wizard, Bond Calculator, and Bond Alerts. Schwab also provides you with a diverse bond investment selection, including hundreds of fee-free bond mutual funds. Otherwise, it charges $1 per secondary market trade; secondary Treasury bond trades are free. Schwab’s BondSource research tool gives you data on more than 60,000 bonds. TD Ameritrade enables forex trading while Schwab does not. The thinkorswim platform provides the tools and data to support your forex trades. Schwab requires clients to invest at least $1,000 to open standard brokerage accounts. Monthly deposits of $100 or more will see that investment minimum waived. TD Ameritrade does not require a minimum balance to trade. TD Ameritrade offers you a choice of seven types of retirement accounts from a traditional IRA to a 401(k). You can also decide to open an education account – a 529 plan, a Coverdell Education Savings Account or a custodial Uniform Gift to Minors account. The firm’s selection of special accounts ranges from trusts to small business plans. You can also choose a managed portfolio account or a margin trading account. Once your investments begin to pay off, you will need a tax strategy to keep more in your pocket and less in Uncle Sam’s. While neither brokerage firm offers tax planning services, they do have information aimed at helping you to make smart tax decisions. One way to defer taxes is to contribute to an IRA account, which Schwab offers as a component of its financial management platform. The Schwab Tax Center is full of resource guides, current rules, and rates that you can refer to when putting together a tax plan. The Tax Resource Center on the TD Ameritrade site features an estate planning guide as well as in-depth articles on a full suite of tax topics and strategies. You can also contribute to an IRA to defer tax liabilities until retirement. Charles Schwab is frequently touted for its responsive customer service. When you need answers, whether during business hours or on a Sunday night, Schwab makes help available via phone or live chat. You can also get in-person advice at one of their many branch offices. TD Ameritrade offers similar customer service channels. You can call, email, or chat 24/7, or you can drop by a branch if that’s easier. Both TD Ameritrade and Schwab have full mobile apps that sync easily with the desktop platforms for easy access wherever you go. One unique feature of TD Ameritrade’s mobile option is that you can use either the base trading platform or the thinkorswim app, and if you use both, you have access to the entire TD Ameritrade system. Schwab’s app lets you make deposits to your accounts on-the-go, so you can bypass the bank and get right to trading. TD Ameritrade offers apps for iPhone, iPad, Android, Android tablet, and Apple Watch. Schwab offers all of these, too, with the exception of an Android tablet app. Both firms offer a full spectrum of investing tools, charts, and profiles available via mobile devices. (Both brokerage firms have established platforms for Mac and Windows desktop trading). Even though TD Ameritrade levies a higher per-trade fees than Schwab, it wins in an overall head-to-head comparison. TD Ameritrade does not require an investment minimum, it caters to beginners but is sophisticated enough for expert investors, and it offers all the tools and data necessary to make informed investment choices. If you are just beginning to explore your investment options, you may find Schwab’s platform to be more accessible and easier to navigate. You may also be able to save a few bucks by choosing Schwab over TD Ameritrade. On the other hand, if you prefer to have as many options as possible when you sit down to strategize your portfolio, you’ll appreciate TD Ameritrade’s thinkorswim platform. Schwab, founded by Charles R. Schwab in 1971, is one of the nation’s largest brokerage firms and banks. Based in San Francisco, Schwab was originally called First Commander Corporation, but within two years of opening for business, Schwab and his partners acquired the company’s stock and changed its name to Charles Schwab & Co.
Schwab built its customer base by offering discount commission rates on stock trading. As of 2017, Schwab had four divisions – investment, trading, banking, and wealth management – 345 branches across 46 states as well as an online platform. Its assets exceed $3 trillion. TD Ameritrade got its start in 1975 as First Omaha Securities Inc., a corporation founded by J. Joseph Rickets and partners. Ameritrade Clearing Inc. came along in 1983, and within five years had pioneered a telephone quote and order system. In the mid-1990s, Ameritrade offered online trading. In 2006, the brokerage acquired TD Waterhouse from the Toronto-Dominion Bank and became TD Ameritrade. As of 2017, the brokerage firm was facilitating more than 500,000 trades daily for its customers. Its chief source of revenue is commissions, which accounted for over one third of its income in its most recent annual report. TD Ameritrade does not offer in-house banking like Schwab, but it does facilitate interest-earning cash management accounts for customers through third-party banks. Because Schwab owns a bank, it offers interest-bearing stand-alone savings and checking accounts to its brokerage customers. You can also get Schwab-branded credit and debit cards.